In the first experimental use of algorithms that employ structure-based molecular modeling to optimize de-immunized drug candidates, Karl Griswold, Ph.D., and co-investigator Christopher Bailey-Kellogg, Ph.D., of Dartmouth College complement their prior sequence-based de-immunizing algorithms and expand the tool kit of protein engineering technologies to use in next-generation drug development. Their paper, "Protein Deimmunization via Structure-Based Design Enables Efficient Epitope Deletion at High Mutational Loads," was published online on February 5, 2015 in Biotechnology and Bioengineering. "This work is part of our larger collaborative initiative to develop performance-enhanced protein drugs that are invisible to the human immune system," explained Dr. Griswold. "Biotherapeutics offer potent treatment options for a wide range of diseases but, due to their biological origins, these powerful therapies can elicit detrimental immune responses in humans." Development of biotherapeutic agents is a time-consuming and costly endeavor, and there exists a substantial risk that deleterious immunogenicity issues will undermine otherwise promising drug candidates late in the development process. While methods for identifying immunogenic hotspots, or epitopes, are evolving rapidly, technologies to redesign the hotspots, while maintaining biotherapeutic activity and stability are far less developed. The current study employed P99 betalactamase, a component of Antibody-Directed Enzyme Prodrug Therapy, to show that structure-based de-immunization resulted in highly-active and stable biotherapeutic designs that were different from those generated with earlier sequence-based algorithms. In particular, the structure-based designs remodeled a putative immunogenic hotspot that was not readily addressed with other methods. Scientists from the Gladstone Institutes and the University of California, San Francisco report in the February 11, 2015 issue of the Journal of Neuroscience that raising levels of the life-extending protein klotho can protect against learning and memory deficits in a mouse model of Alzheimer’s disease. Remarkably, this boost in cognition occurred despite the accumulation of Alzheimer-related toxins in the brain, such as amyloid-beta and tau. Klotho decreases naturally with aging, which also leads to a decline in cognitive ability. An earlier study from these researchers revealed that having a genetic variant that increases klotho levels is associated with better cognition in normal, healthy individuals, and experimentally elevating klotho in mice enhances learning and memory. However, klotho’s influence in the face of aging-related cognitive disorders like Alzheimer’s disease was unclear. To test klotho’s protective capacity, the scientists created a mouse model of Alzheimer’s disease that produced higher levels of this protein throughout the body. Ordinarily, Alzheimer’s-model mice have cognitive deficits, abnormal brain activity, and premature death, but raising klotho levels meliorated these problems. The cognition-enhancing effects of the protein were powerful enough to counteract the effects of Alzheimer-related toxins, whose levels were unchanged. “It’s remarkable that we can improve cognition in a diseased brain despite the fact that it’s riddled with toxins,” says lead author Dena Dubal, M.D., Ph.D, (http://profiles.ucsf.edu/dena.dubal)an Assistant Professor of Neurology and the David A. Coulter Endowed Chair in Aging and Neurodegenerative Disease at UCSF. “In addition to making healthy mice smarter, we can make the brain resistant to Alzheimer-related toxicity. Several recent science studies have claimed that the gut microbiome, the diverse array of bacteria that live in the stomach and intestines, may be to blame for obesity. But Katherine Pollard (photo), Ph.D., a Senior Investigator at the Gladstone Institutes in San Francisco, says it is not that simple. Dr. Pollard presented her work at the Obesity and Microbiome symposium at the AAAS Annual Meeting in San Jose, California, on Friday, February 13, 2015 at 3:00 pm PT. Using powerful computational tools, Dr. Pollard and her team have re-analyzed several previous studies and revealed that there is no significant relationship between body mass index (BMI) and the types of microbes in one's gut. In fact, her lab found that there was greater variability in gut bacteria between the different studies than between the lean and obese individuals within each study. Instead, Dr. Pollard thinks that it is the genetic make-up of the different strains of bacteria that is most important. This is because the DNA in bacteria can vary wildly. For example, while the genomes of two humans may only differ by 0.1%, two strains of the same bacteria can vary by to 30%--similar to the variation between human and mice genomes! What's more, the differences in the bacterial genomes are often important pieces that are involved in metabolism or the processing of sugar and fat. Besides reflecting important functional changes in bacterial genomes, losses and gains of genes also affect genome size. When microbiomes are studied using metagenomics--sequencing their total DNA--differences in bacterial genome size can bias the estimation of the proportion of each gene in the sample. By developing a computational shortcut to rapidly estimate genome size using statistical modeling, Dr.
As reported by PMLive on Janurary 15, 2015, Merck & Co. has agreed to a deal with Eli Lilly & Co. to research combination cancer treatments involving Merck's promising immunotherapy Keytruda, approved by the FDA in September 4, 2014. “The two companies will investigate several different regimens that put Keytruda (pembrolizumab), part of the highly anticipated anti-PD-1 (anti-programmed death receptor 1) class of cancer immunotherapies, together with a cancer compound in Lilly's portfolio. The companies confirmed three study programs that will take place as part of the collaboration, including a phase II study combining Keytruda and Lilly's Alimta (pemetrexed) in lung cancer,” PMLive reported. Furthermore, acccording to PMLive, “a second lung cancer study, this time phase I/II, will combine Keytruda with the investigational drug necitumumab, while the pairing of Keytruda and Cyramza (ramucirumab) will be investigated in multiple cancers in phase I/II trials.” PMLive said that additional details, including financial terms of the deal, had not disclosed. According to PMLive, the Merck-Lilly collaboration highlights the importance of Keytruda to Merck's growth plans. The drug is one of the most advanced drugs in the anti-PD-1 class, and became the first such product approved in the U.S., when it received FDA backing for the treatment of melanoma patients in September 2014 (see more on this below). A region of the brain thought to control speech production develops abnormally in children who stutter--a pattern that persists into adulthood, according to new University of Alberta (Canada) research. In the first study to use MRI imaging to examine brain development in both children and adults who stutter, researchers at the U of A's Institute for Stuttering Treatment and Research (ISTAR) found abnormal development of grey matter in Broca's area, the region of the frontal lobe responsible for speech. It was the only abnormality found in the 30 regions of the brain the research team investigated. "In every other region of the brain we studied, we saw a typical pattern of brain matter development. These findings implicate Broca's area as a crucial region associated with stuttering," said Dr. Deryk Beal, ISTAR executive director and an assistant professor in the Faculty of Rehabilitation Medicine. Dr. Beal's team, which included collaborators from the University of Toronto, studied MRI images of the brains of 116 males between the ages of six and 48 years--both the largest group and widest age range –ever --for such a study. Roughly half the participants stuttered; the rest served as a control group. The research team observed a steady, and expected, decline in the cortical thickness of grey matter in the control group--a decline not observed in people who stutter. This decline in thickness, Dr. Beal explained, is actually a good thing because it reflects how the brain gets more efficient as we age, requiring fewer neural resources. "One interpretation of this finding could be that this area, in people who stutter, does not operate as efficiently within the brain network for speech production," Dr. Beal said. Scientists at the Karolinska Institute in Swedne in have evaluated a new Alzheimer’s therapy in which the patients receive an implant that stimulates the growth of a certain type of nerve cell. The results, which were published online on February 9, 2015 in the scientific journal Alzheimer's & Dementia, suggest that the introduction of a nerve growth factor (NGF) can prevent neuronal degradation in Alzheimer’s patients. The title of the new article is, “Changes in CSF Cholinergic Biomarkers in Response to Cell Therapy with NGF in Patients with Alzheimer’s Disease.” Patients with Alzheimer’s disease are known to suffer a selective and early breakdown of so-called cholinergic nerve cells, which require a specific NGF to function. 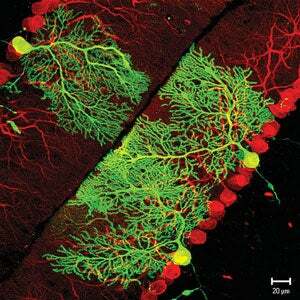 [Nerve growth factors (NGFs) are, essentially a group of proteins necessary for nerve cell growth and survival]. As NGF levels decline, the cholinergic nerve cells begin to degrade and the patient’s condition slowly deteriorates. In an attempt to curb the breakdown of the cholinergic nerve cells, researchers at the Karolinska Institute’s Centre for Alzheimer’s Research, and their colleagues at Karolinska University Hospital’s neurosurgery clinic, and at the Danish biotech company NsGene introduced NGF directly into the brains of Alzheimer’s patients. To do this, they used NGF-producing cell capsules, placing them in the basal fore-brain, where the cholinergic cells reside, using precision stereotactic surgery. There, the capsules, which can easily be removed, release NGF to the surrounding cells in order to prevent their degradation. The study, now published in Alzheimer’s & Dementia, is based on data from six Alzheimer’s patients. The Biogerontology Research Foundation (BGRF), a UK-based charity committed to the support of aging research to address the challenges of a rapidly aging population and to reduce the impact of disease on future generations, announces the publication of research into personalizing nootropic drugs using in silico prediction methods. The research, published online on Febuary 6, 2015 in an open-access article in Frontiers in Systems Neuroscience, uses gene expression data to evaluate activated or suppressed signaling pathways in tissues or neurons of the cognitively enhanced brain. The title of the article is. “Screening and Personalizing Nootropic Drugs and Cognitive Modulator Regimens in Silico.” [BioQuick Editor's Note: Nootropics, also referred to as smart drugs, memory enhancers, neuro enhancers, cognitive enhancers, and intelligence enhancers, are drugs, supplements, nutraceuticals, and functional foods that improve one or more aspects of mental function, such as working memory, motivation, and attention. The word nootropic was coined in 1972 by the Romanian Dr. Corneliu E. Giurgea,and is derived from the Greek words for "mind," and for "to bend" or "to turn."]. The scientists report that an algorithm maps expression data onto signaling pathways. The collective pathways, and their activation, form what is called a "signaling pathway cloud," a biological fingerprint of cognitive enhancement (or any other condition of interest). Drugs can then be screened and ranked based on their ability to minimize, mimic, or exaggerate pathway activation or suppression within that cloud. A clinical trial led by University of Leicester respiratory experts into a potentially ground-breaking “breath test” to detect lung cancer is set to get underway at the Glenfield Hospital in Leicester, UK. It is hoped that the LuCID (Lung Cancer Indicator Detection) program will lead to a non-invasive method of diagnosing lung cancer in the early stages. The company behind the device, Cambridge-based Owlstone Nanotech Ltd, carried out a health economic analysis and determined that detection of early-stage lung cancer could be increased from the current 14.5% to 25% by 2020. It is estimated this could save 10,000 lives and £250m of NHS money. Four publicly funded health care systems in the countries of the United Kingdom are referred to as the National Health Service (NHS). The “breath-test” device works by measuring volatile organic compounds (VOCs) at low concentrations in a patient’s breath and offers a cheaper and smaller alternative to existing detection technologies. Supported by the University of Leicester’s enterprise and business development team and Leicester’s Hospitals, Owlstone was awarded £1m by the NHS Small Business Research Initiative (SBRI) towards the second phase of the LuCID project – the clinical trials. The aim is to further evaluate Owlstone’s GC-FAIMS (Gas Chromatography – Field Asymmetric Ion Mobility Spectrometry) sensor in a rapid-access lung cancer clinic at Glenfield Hospital, Leicester, starting later this year. If successful, the project will pave the way to evaluate the technology in GPs’ surgeries and other hospitals. Just as human relationships are a two-way street, fusion between cells requires two active partners: one to send protrusions into its neighbor, and one to hold its ground and help complete the process. Researchers have now found that one way the receiving cell plays its role is by having a key structural protein come running in response to pressure on the cell membrane, rather than waiting for chemical signals to tell it that it's needed. The study, which helps open the curtain on a process relevant to muscle formation and regeneration, fertilization, and immune response, was published online on February 12, 2016 in journal Developmental Cell. "We knew that in cell fusion, one cell attacks its fusion partner, but we didn't know what the other cell was doing," says Elizabeth Chen, Ph.D., an Associate Professor of Molecular Biology and Genetics at the Johns Hopkins University School of Medicine. "Now we know that the other cell is putting up some resistance." The merging of two cells, which is crucial to conception, development, and physiology of complex organisms, was long thought to be a symmetrical process, where two cells contribute equally. But two years ago, Dr. Chen's research group showed that, in fact, one of the fusion partners initiates the process by extending fingerlike protrusions into the other partner. For the current study, Dr. Chen's group and collaborators focused on the receiving partner. Using fruit fly embryos and lab-grown fly cells that were induced to fuse, they saw that in the areas where the attacking cells drilled in, the receiving cells quickly fortified their cellular skeletons, effectively pushing back. "We think that by stiffening its skeleton in this way, the receiving cell avoids moving away from the attacking cell, in which case fusion couldn't occur," Dr. Chen says.